Two men who were found with more than 200 wraps of class A drugs, worth more than £2,000, have been jailed. Layek Hussain and Shipu Qureshi were known to police after several concerned residents reported drug dealing in Cambridge. Hussain, 22, and Qureshi, 39, were parked in a Co-op car park when two officers approached in an unmarked police car. The officers caught the pair off guard by opening the driver and passenger doors of their Vauxhall Astra simultaneously and arresting them. Two bundles of class A drugs were found containing 217 wraps of drugs, worth £2,170. Officers also found £1225 in a bundle of notes, with a mobile phone containing drug dealing messages. 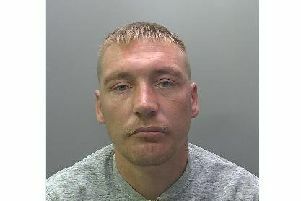 Both men were found guilty following a three-day trial and were sentenced on Thursday at Peterborough Crown Court. Hussain, of Britten Place, Cambridge, was sentenced to four years imprisonment for possession of crack cocaine and heroin and possession of criminal property. Qureshi, of Discovery Way, Cambridge, was sentenced to serve five-and-a-half years for the same offences. PC Steve Girdlestone said: “The quantity of cash and drugs found with these two demonstrates the extent of their criminal activity.